Paper chemicals designate a group of chemicals that are used for paper manufacturing, or modify the properties of paper. These chemicals can be used to alter the paper in many ways, including changing its color and brightness, or by increasing its strength and resistance to water. albarine "Natural Sulfate of Lime" CaSO4.2H2O building materials. DTPA Diethylene Triamine Penta Acetate C14H33N3O10 Used for chelation (removal of transition metals from pulp). EDTA Ethylene Diamine Tetra acetic Acid C10H16N2O8 Used for chelation (removal of transition metals from pulp). Sodium Bisulfite Sodium bisulfite NaHSO3 An acid type cooking liquor chemical component sometimes used to neutralized residual chlorine in the pulp during the bleaching process. Sodium Silicate Sodium Silicate Na2SiO3 In waste paper deinking for wetting, peptization, ink dispersion, peroxide stabilization. Surfactant Used in deinking. Used as debonders in fluff pulp manufacture. Titania Titanium Dioxide TiO2 Filler to increase the opacity and brightness of paper. Used in coating. Chemical pulping involves dissolving lignin in order to extract the cellulose from the wood fiber. 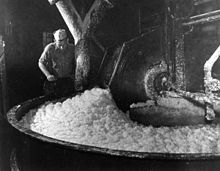 The different processes of chemical pulping include the Kraft process, which uses caustic soda and sodium sulfide and is the most common; alternatively, the use of sulfurous acid is known as the sulfite process, the neutral sulfite semichemical is treated as a third process separate from sulfite, and soda pulping which is the least ecologically hazardous utilizing sodium hydroxide or anthraquinone. Caustic soda is added to increase the pH in the pulping process of fibers. The higher pH of the paper-fiber solution causes the fibers to smoothen and swell, which is important for the grinding process of the fibers. Elemental chlorine bleaching uses chlorine and hypochlorite. Elemental chlorine-free bleaching is more environmentally friendly since it eliminates the use of hypochlorite and replaces chlorine with chlorine dioxide or sodium chlorate. Totally chlorine-free bleaching utilizes oxygen and hydrogen peroxide. This is the most environmentally friendly process since it eliminates all chlorinated pollutants. Most paper types must have some water-resistance to maintain a specific writing quality and printability. Until 1980, the typical manner of adding this resistance was by using a rosin in combination with alum. When the paper industry started using chalk instead of china clay as filler, the paper chemistry had to switch to a neutral process. Today, mainly AKD (alkyl ketene dimer) and ASA (alkenyl succinic anhydride) are used. Wet-strength additives ensure that paper retains its strength when it gets wet. This is especially important in tissue paper. Chemicals typically used for this purpose include epichlorohydrin, melamine, urea formaldehyde and polyimines. These substances polymerize in the paper and result in the construction of a strengthening network. To enhance the paper's strength, cationic starch is added to wet pulp in the manufacturing process. Starch has a similar chemical structure as the cellulose fibre of the pulp, and the surface of both the starch and fibre are negatively charged. By adding cationic (positive charged) starch, the fibre can bind with the starch and thus also increase the interconnections between the fibres. The positively charged portion of the starch is usually formed by quaternary ammonium cations. Quaternary salts that are used include 2.3-epoxy propyl trimethyl ammoniumchloride (EPTAC, also known as or Glytac Quab, GMAC™) and (3-chloro-2-hydroxypropyl) trimethyl ammonium chloride (CHPTAC, also known as Quat 188, Quab 188, Reagens™). Dry-strength additives, or dry-strengthening agents, are chemicals that improve paper strength normal conditions. These improve the paper's compression strength, bursting strength, tensile breaking strength, and delamination resistance. Typical chemicals used include cationic starch and polyacrylamide (PAM) derivatives. These substances work by binding fibers, often under the aid of aluminum ions in paper sheet. Binders promote the binding of pigment particles between themselves and the coating layer of the paper. Binders are spherical particles less than 1 µm in diameter. Common binders are styrene maleic anhydride copolymer or styrene-acrylate copolymer. The surface chemical composition is differentiated by the adsorption of acrylic acid or an anionic surfactant, both of which are used for stabilization of the dispersion in water. Co-binders, or thickeners, are generally water-soluble polymers that influence the paper's color viscosity, water retention, sizing, and gloss. Some common examples are carboxymethyl cellulose (CMC), cationic and anionic hydroxyethyl cellulose (EHEC), modified starch, and dextrin. Styrene butadiene latex, Styrene acrylic, dextrin, oxidized starch are used in coatings to bind the filler to the paper. Co-binders are natural products such as starch and CMC (Carboxymethyl cellulose), that are used along with the synthetic binders, like styrene acrylic or styrene butadiene. Co-binders are used to reduce the cost of the synthetic binder and improve the water retention and rheology of the coating. Binder spheres coated with acrylic acid (a) and anionic surfactant (b). The molecular structure of cationic starch. The repeating unit of starch is derived from glucose interconnected with glycosidic bonds. Mineral fillers are used to lower the consumption of more expensive binder material or to improve some properties of the paper. China clay, calcium carbonate, titanium dioxide, and talc are common mineral fillers used in paper production. A Retention agent is added to bind fillers to the paper. Fillers, such as calcium carbonate, usually have a weak surface charge. The retention agent is a polymer with high cationic, positively charged groups. An additional feature of a retention agent is to accelerate the dewatering in the wire section of the paper machine. Polyethyleneimine and polyacrylamide are examples of chemicals used in this process. Pigments that absorb in the yellow and red part of the visible spectrum can be added. As the dye absorbs light, the brightness of the paper will decrease, unlike the effect of an optical-brightening agent. To increase whiteness, a combination of pigments and an optical-brightening agent are often used. The most commonly used pigments are blue and violet dyes. Optical brightener is used to make paper appear whiter. Optical-brightening agents use fluorescence to absorb invisible radiation from the ultraviolet part of the light spectrum and re-emit the radiation as light in the visible blue range. The optical-brightening agent thus generates blue light that is added to the reflected light. The additional blue light offsets the yellowish tinge that would otherwise exist in the reflected light characteristics. It thus increases the brightness of the material (when the illumination includes ultraviolet radiation). ^ Office of Air and Waste Management; Office of Air Quality Planning and Standards (August 1977). "10 Wood Processing". In Lahre, Thomas (ed.). Compilation of Air Pollutant Emission Factors (PDF) (3rd ed.). Research Triangle Park, North Carolina 27711: U.S. Environmental Protection Agency. p. 419. ISBN 978-1-249-50100-8. Retrieved 7 September 2015. ^ Performance chemicals for the pulp and paper industry (PDF) (Report). Gothenburg, Sweden: EKA Chemicals/Akzo Nobel. 2011. p. 2. ^ "7.3.9. Totally Chlorine-Free Bleaching of Papergrade Kraft Pulps". Supplemental Technical Development Document for Effluent Limitations Guidelines and Standards for the Pulp, Paper, and Paperboard Category (Report). Washington, D.C.: U.S. Environmental Protection Agency (EPA). October 1997. pp. 7–26. EPA-821-R-97-011. ^ Fardim, Pedro (2000). "Paper and Surface Chemistry Part 1- Fiber Surface and Wet End Chemistry". Institute of Quimica: 1–14. ^ Fardim, Pedro (2000). "Paper and Surface Chemistry Part 2- Coating and Printability". Institute of Quimica: 1–13. ^ Granier (1994). "Adhesion of latex particles on inorganic surfaces". Tappi J. 77 (5): 419. ^ "Market Study: Fillers (3rd edition)". Ceresana. January 2014. Retrieved 7 September 2015. This page was last edited on 11 March 2019, at 23:03 (UTC).